Leading Leaders: I believe everyone can reach high levels of performance and be happy in their work if inspired, empowered and motivated. By far, my most popular book, Leading Leaders is the leadership philosophy to get teams and individuals to perform their best based on nearly three decades of leading diverse teams around the world. My leadership philosophy is based on five “bricks” in the foundation of any leader’s method, and is time tested in even the most stressful environments. And it works in any environment–not just the military! I’ve successfully led by these principles in volunteer work, with contractors, and of course on the job. Integrity: Leaders must both model and require honesty and a whole-person mindset. Without the this cornerstone, there can be no trust between the leader and the team. Respect: People have inherent value, and leaders must cultivate an environment of respect between members of the team, as well as between the team and the leader. Respect is a prerequisite for teamwork. Teamwork: Individuals can and do excel, but teams get more done! By looking at everyone as a potential teammates, and building diverse teams where everyone is valued, leaders can inspire high performance and job satisfaction! Leaders Lead: Job satisfaction and high performance comes from when leaders empower others to lead as well. By pushing authority out and enabling others to contribute to their maximum ability, leaders can inspire others to new heights! Little Things Matter: Little things add up to big things–the trick is knowing which little things to watch! Sort through the “chaff” and focus on the “wheat” in order to help your team reach their full potential without bogging them down. Colonel Mickey Addison is a leaders’ leader. I have personally watched him lead and he practices what he writes about in his excellent book, “Leading Leaders”. His book is easy to read and contains leadership pearls of wisdom that the reader can use to become an truly effective leader. The way the book is written and organized makes his principles easy to follow and will enable the reader who aspires to become a great leader, achieve that goal! Our nation is crying out for leaders. In this gem of a book, Colonel Mickey Addison shares the timeless lessons of leadership he learned in sports, in the Boy Scouts, and in a successful career in the US Air Force. Filled with unforgettable stories illustrating the principles of leadership, “Leading Leaders,” is a must read for anyone who desires success at the highest level, whether in sports, in business, or personally. Whether you are just beginning your career, or a seasoned executive, you’ll want to keep a copy of “Leading Leaders” on your desk as a handy reference. Buy it, read it, and apply its principles. Everyone who works on a team or has the role of leading people in any way should read this book. The leadership lessons are valuable for managers, team captains, and leaders from the CEO all the way down. I’ve watched Mickey get more done than a single person could ever achieve on their own for nearly two years. Now I see how he does it! Leading Leaders is not only worth the read, but more than that, worth putting into practice. Riveting! A great mixture of personal stories and leadership principles that represent years of Mickey’s successful strategies. 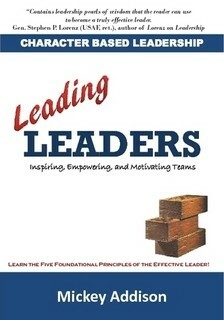 Perfect for new and long-time leaders; if you only read one leadership book this year, it should be this one. Colonel Addison has captured a lifetime of leadership experiences in this elegantly written, and captivating guide. His experiences in inspiring others, grounded in personal character, and refined throughout a distinguished military career, are distilled into this succinct and highly recommended volume. Leading Leaders is a must read for aspiring young leaders and serves as a critical reference for senior leaders to gauge their own leadership skills. Mickey captures the timeless foundations of effective leadership through his own experiences as an Air Force officer as well as the successes of those that have gone before him. I look forward to adding it to my library of leadership primers and using it as a reference in my own leadership discussions. More than just another non-fiction work on management or leadership, Addison interjects his own anecdotes throughout the book, and many of them are wonderful examples, not only of successes, but also of failures in communication from which the author has learned much. Colonel Mickey Addison has led a number of organizations throughout his life from sports teams to Scout troops to military units. During this time what Mickey repeatedly demonstrated was: while the environment and teammates may have changed, the success he is able to achieve through his leadership process did not. As Mickey so rightly points out, “People change and goals change, but the fundamental leadership challenge of working with a group to achieve a shared goal remains essentially the same.” For the executive leader, that means leading other leaders and sometimes “leading” a boss as well. Colonel Addison’s experience and success speaks for itself; and his latest book, “Leading Leaders”, is a clear and easy to read roadmap showing the way to anyone who is responsible for drawing out the greatness in others. “To build something that lasts, you must start with a solid foundation.” This well-known adage forms a foundation itself for Leading Leaders. Drawing on his experiences leading people and organizations over a twenty-plus year career as an Air Force officer, Mickey weaves in stories that lend depth and context to the five bricks that comprise his leadership foundation. This foundation works. Sharing a similar background as Mickey, and some of the same senior leaders, I’ve seen these leadership fundamentals in action around the globe. And I’ve seen what happens when they’re absent. Both aspiring and well-seasoned leaders will put this book down better prepared, or re-grounded, in what it takes to lead successfully. Leadership is so important in every walk of life, but something often elusive to managers. Leadership inspires and creates a situation where people perform collectively and individually at a level far greater than thought possible. This book lays out leadership in a logical format and gives today’s managers practical leadership theory, sprinkled with real-world situations of how leadership works…or how the lack of leadership can be destructive. Read this book once as a look at leadership. Read this book again and again as a constant reminder of how to make leadership a part of your management style. This is a tool every leader needs in his/her tool box. Whether you’re building a foundation or fine tuning your organization, this is a must read. As a member of a leadership team of a Fortune 500 company I have attended many “Leadership” training seminars. “Leading Leaders “ by Mickey Addison gets to the core principles of what leadership IS and can be applied to any business or enterprise from Little League to the corporate board room.